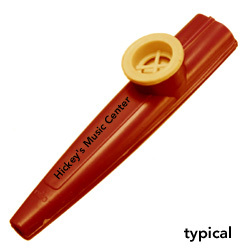 Classic one-piece plastic kazoo has our name and logo emblazoned on the top for improved tone, intonation and projection. * Colors will vary, but if you have a preference, please let us know and we'll do our best to accomodate you! * All this is true except that part about tone, intonation and projection.